Crack egg, separate egg white from yoke and place in 2 separate small bowls. Beat egg white until “frothy”. 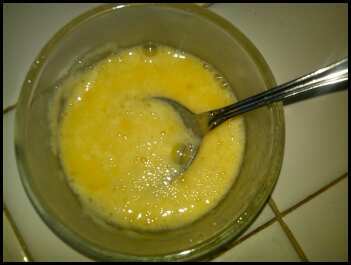 Mix 1 Teaspoon of honey and ¼ Teaspoon Apple Cider Vinegar in with egg yoke. Stir. Fold yoke mixture in with frothy egg whites. Heads up: YOU WILL FEEL YOUR SKIN TIGHTENING! Rinse with warm water, pat dry. APPLE CIDER VINEGAR contains natural enzymes, vitamins and minerals and is rich in antioxidants. It has Vitamins A, B and C, beta carotene, bioflavonoids, calcium, magnesium, potassium,phosphorus, copper, iron, sulfur, iron, fluorine, silicon, boron and pectin. How’s that for super vinegar! It naturally balances the pH balance of the skin, fight bacteria, infections and is a natural anti-fungal, AND it reduces inflammation. It is an awesome astringent(toner), for sensitive and oily skin. Vinegar can even do wonders for acne and itchy skin conditions due to eczema and sunburn and can help blast fungal infections, warts and even skin tags! HONEY: The natural occurring acids in honey acids are very safe to use on skin and can loosen bonds between the dead skin cells junking up your skin, making it easier to shed the dead layer and reveal your smoother more glorious skin underneath! These acids also increase elasticity,balance out oily skin, stimulate collagen production, and minimize lines and wrinkles making you look younger and more “new and improved”! EGGS: An egg mask is one of the best natural remedies for irritated skin. Eggs contain amino acids that help in reduction of any inflammation. Eggs not only smooth and tighten the skin, but help shrink pores.